Rebecca Ellison | i Love Facedowns! HAHAH this first one made me guffaw!! HA! 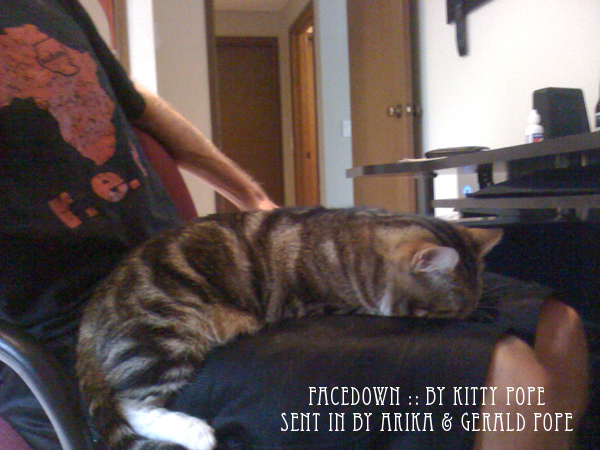 a Kitty facedown – NEVER thought we’d see one of these!! Thanks to the Pope’s for sending this in!! After a long day & long into the night of working as a photographer…. this is what happens! 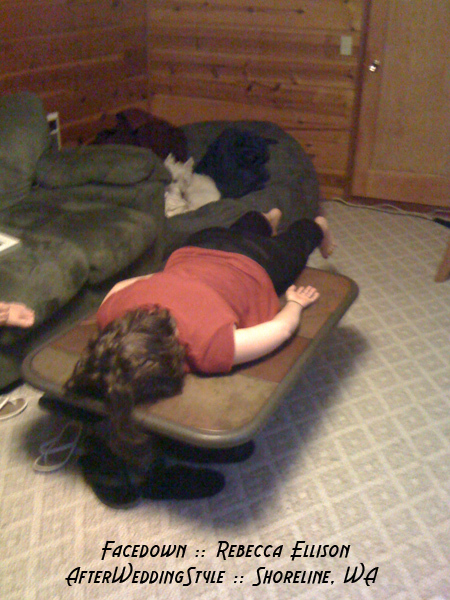 You end up facedown on a rolling cart… exhausted style!! Ooookay – I have a confession… This wasn’t a REAL submission. In fact – this was STOLEN off of facebook, by my sister Vera (cause I always throw her under the bus – sorry vera! love you!) 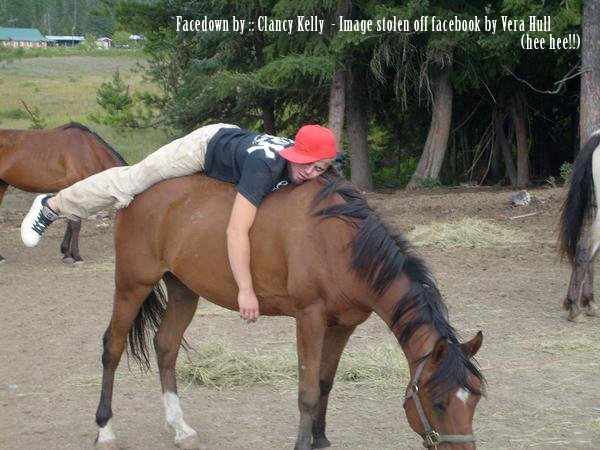 from my cousin Clancy’s page!! BUT – I mean – honestly how could he have taken this awesomely rad photo of a facedown on a HORSE w/o wanting us to steal it??! THANK YOU GUYS FOR PLAYING!! 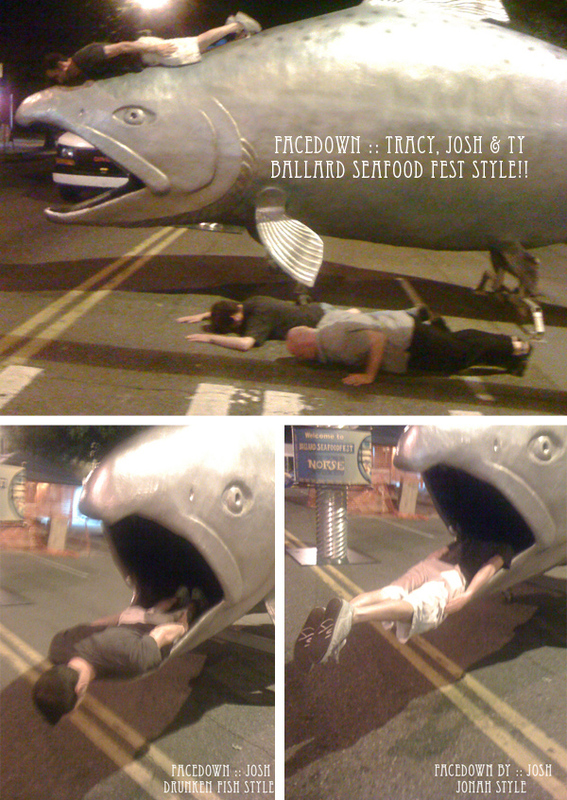 Can’t wait for next Facedown Friday!!!!! 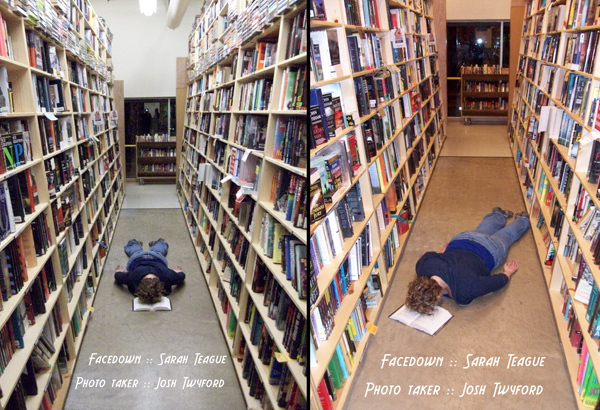 In a little town far far away… we’ll call it Portland – lives two friends of Rebecca Ellison (a well known Seattle photographer & facedowner) – these friends, (we’lll call them Josh Twyford & Sarah Teague) spent an evening at the deserted bookstore – Powell Books where they layed facedown. In the aisle. On a book. A good book I bet. Thank you FACEBOOK & BECCA for sharing this FD phenom. WE LOVE FD SUBMISSIONS!!! Keep em comin folks!